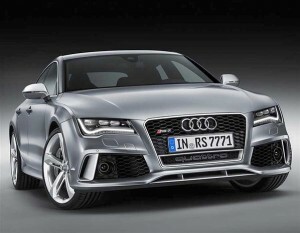 The Detroit Motor show has arrived baring many gifts, one of which is a glimpse at Audi’s new RS model, the RS7. It is a four-door coupe which is set to replace the RS6 Saloon and it will feature the same 552bhp 4.0-litre twin-turbo V8 as the RS6 Avant. This kind of power makes for some pretty astonishing acceleration, making the RS7 able to do 0-62 in 3.9 seconds! The RS7 also has a top speed of 155mph, unless you opt for the Dynamic or Dynamic Plus option which allows you to supress the speed capper, in turn increasing the top speed to 174mph or 189mph respectively. The brakes are massive; necessary to tame such a powerful car. With the RS7 you get torque vectoring, adaptive air suspension and Audis Sport Differential as standard. It is a very good looking vehicle and the styling is typical of Audi, but by no means is it boring. It looks like a thirsty car, and it is one, though it may not guzzle as much as you would expect: Thanks to cylinder deactivation technology, the RS7 can do 28.8mpg. Whilst the RS7 was created primarily with the US market in mind it will be available in the UK and prices are expected to begin around £84,000 – £7,000 more than the RS6 Avant, but considerably cheaper than its main competitor the BMW M6, and similarly priced to the Mercedes-Benz CLS63 AMG. Do you think the RS7 will equal the standards set by the Audi RS3, RS4 and RS5?